Selfie Police: Wat’cha gonna do? Samantha Behl photo REV. FRANCE A. DAVIS, SHEREE HAGGAN AND MARVIN ROBERTS stand together and sing “We Shall Overcome” at the end of the Access and Diversity Center’s Martin Luther King Jr. Day celebration in the TSC Ballroom on Wednesday evening. I think they take away from student space. It’s just awkward having them there. leaving the rest for students, he added. “This minimal-invasion approach appears to have been successful,” Morales said. “Students still have sufficient space for their needs, and the new unit has adequate room for its operations.” The change in organization is part of a campus-wide initiative to more formally organize the people in business services, according to David Cowley, vice president for business and finance. Taya Flores is the financial officer for Student Services and now has an office in the new cubicles. She is happy with the location because of its proximity to Morales. Flores said providers of business services were scattered in different departments before, instead of being centralized. “The work existed, the positions existed; we’ve just pulled them out and put them in one place,” Flores said. Nick Carpenter photo NATHAN HAUCK practices as he waits for a guitar lesson in the Fine Arts Visual Building. Features: Credit Specialist , Appraiser, Title Company, and Loan Officers. Food will be served. Zak Riklefs photo THE FORMERLY LDS-OWNED church, nicknamed the Golden Toaster, sits on the corner of U.S. Highway 89 and 1200 East in Logan. The future of the Cache Valley landmark is currently unknown. In The Jan. 14 story, “Heathen Sunday: Not a place for negativity, hate,” the wrong person was identifed in the photo. The man’s name is Zac Neubert. The policy of The Utah Statesman is to correct any error made as soon as possible. If you find something you would like clarified or find in error, 71454 please contact the editor at 797-1742, statesman@aggiemail.usu.edu or come in to TSC 311. CAN’T SLEEP AT NIGHT, HOW CAN YOU DREAM OF RETIREMENT? At TIAA-CREF, we want you to be confident about your retirement. Not worried. That’s why we’ve spent the last century helping our customers plan and manage their finances to get them through every single day of their retirement. It’s how we deliver Outcomes That Matter. Expert advice to get you to and through retirement. Get started at TIAA.org/plan. BEST OVERALL LARGE FUND COMPANY The Lipper Award is based on a review of 36 companies’ 2012 risk-adjusted performance. The Lipper award is given to the group with the lowest average decile ranking of three years’ Consistent Return for eligible funds over the three-year period ended 11/30/12. TIAA-CREF was ranked against 36 fund companies with at least five equity, five bond, or three mixed-asset portfolios. Past performance does not guarantee future results. For current performance and rankings, please visit the Research and Performance section on www.tiaa-cref.org. TIAA-CREF funds are subject to market and other risk factors. Ashlee Flygare photo illustration Selfiepolice.org is dedicated to raising money for those who cannot afford college. People who participate pay $1 each time they post a selfie on a social media website. You owe humanity a dollar. It’s a new month, new semester, same column, still unsure about the Eggo waffle. These are the times. Welcome to our “Why did they ever get rid of...?” lineup for January. Pencils up. It was the only PBS children’s program that fused the worthy values of learning, suspense, mystery and viewers like you — thank you. pens all the time. And while we’re at it, let’s bring back Spacemaker labels. That’s right, crayon-scribed first names and possibly last initials if more than one person in class has the same first name. Just like that, we’re saying professors’ names in unison and drinking from complimentary chocolate milk cartons, having everything that made elementary school worth our while. You’re welcome. There you have it; your sharp dash of mind-numbing nostalgia for the month. Send me your suggestions for next month. Do you have something I haven’t thought of? It’s possible, but until you prove it so … yeah, right. – Steve Schwartzman is a senior finishing a degree in communication studies. With eight years of column writing and improvisational comedy under his belt, he lives to make you laugh. Send thoughts to steve.schwartzman@aggiemail. 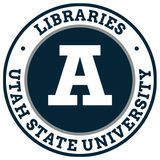 usu.edu. Glance Aggie Schedules Men’s Basketball Wednesday, Jan. 15 USU vs. Colorado State, 7 p.m. Dee Glen Smith Spectrum Saturday, Jan. 18 USU at Boise State, 7 p.m., Boise, Idaho Wednesday, Jan. 22 USU at UNLV, 9 p.m., Las Vegas, Nev. Gymnastics Friday, Jan. 17 USU at Southern Utah, 7 p.m., Cedar City, Utah Friday, Jan. 24 USU vs. BYU, 7 p.m., Dee Glen Smith Spectrum Sunday, Jan. 26 USU at UC Davis, 2 p.m., Davis, Calif.
a hard time scoring. Their percentages were down, and we did a pretty good job.” Shaw and Spencer Butterfield led the Aggies in scoring with 17 points each. This was Shaw’s third game back in the lineup after serving a five-game suspension in December. Shaw also had 10 rebounds, giving him a double-double on the night. Kylee Larsen photo SENIOR GUARD PRESTON MEDLIN attempts a shot over a CSU defender on Wednesday at the Dee Glen Smith Spectrum. USU won 57-50. “I think I’m back now,” Shaw said. “I’m not thinking about being rusty, I’m just trying to stay positive and doing my what I can to help the team.” Butterfield had 14 of his 17 points in the second half and went 5-of-7 in 3-point field goals. “He was very positive out there,” Morrill said. “They came back from the Nevada game and practiced like we played tonight, with a lot of enthusiasm.” The Aggies improved to 10-1 in the Spectrum with the win against Colorado State and improved their conference record to 2-2, with both losses coming on the road. They will be on the road again Saturday against Boise State. “That is what we have to do to have a chance in the Mountain West,” Morrill said. “We’ve got to be physical and we’ve got to do everything it takes to give yourself a chance to win. That was a lot better effort for our guys.” USU returns to the Dee Glen Smith Spectrum at 7 p.m. on Saturday, Jan. 25 to host No. 10 San Diego State. Photo courtesy Clancy Shields JUNIOR MARCUS FRITZ returns a shot during practice. Fritz and the Aggies fell to BYU to open the season and host Idaho State in their home-opener on Monday. Mark Cornelison/Lexington Herald-Leader/MCT photo Arkansas’ Michael Qualls jams in the game-winner as the Razorbacks defeated Kentucky, 87-85, in overtime in Fayetteville, Ark., on Tuesday. called. And too many bad shots, especially for Arkansas. There were too many missed free throws. There were too many turnovers, especially for Kentucky (17). For much of the night, they took bad basketball and threw it over the edge. What’s that about winning ugly? Both teams would have easily taken an ugly win. UK shot 68 percent the first half and trailed by two points at intermission. Why? Kentucky suffered from rampant ball security issues. It committed four turnovers in the first 4:09, seven turnovers in the first 8:30. It was a sloppy, stop-and-start, painful-to-watch first half that included 28 called fouls and 38 free throws, of which just 26 were made free throws. The Cats were just 13 of 22 from the foul line. Yes, Kentucky shot 68 percent from the floor in the first half, but just 59 percent from the line. The Cats committed 10 turnovers in a first half that included eight ties. It was also a first half in which officials spent more time huddling than the Arkansas football team. John Adams, the national director of officials, was at the game, and the crew of Ron Groover, James Breeding and Roger Ayers appeared determined to show him how often they could blow their whistles. The game had no flow, no groove, no rhythm. Start and stop. Or stop and start. Until the end. Give Calipari’s young club credit for having the fortitude to hang in there until the end, to make the play at the end of regulation to get the game into overtime, then the shot (Young’s) near the end of overtime to make Arkansas go out and win it, even if it was on something of a freak play. But then maybe we should have expected that sort of ending on this night. A night of hard-to-watch basketball that ended with such a dramatic finish. care about,” Shields said. “I really believe in this group of people,” McInerney said. “They made me believe.” The men host Idaho State on Monday, while the women travel to Chicago State on Jan. 31 in their season opener. Kobe Bryant’s 81-point game in 2006. Today, nobody shoots that much. It simply won’t happen because talent is more evenly distributed. Nobody can score like Chamberlain, and simply nobody is that selfish anymore in the NBA. If you were wondering, this famous game was against the New York Knicks, and Chamberlain and the Philadelphia Warriors won 169-147 in 1962. 3. NCAA single season rushing yards: Barry Sanders, 2,850 2,850 rushing yards is simply unfathomable. I still don’t get it. Sanders averaged 237.5 rushing yards per game with Oklahoma State. Kevin Smith came close in 2007 for the University of Central Florida, but was still about 300 yards short of the record with two more games than Sanders. Too many offenses have switched to the spread, and too many other players are fast. Sanders’ speed and ability to make something out of nothing were an anomaly back then. Don’t get me wrong: He still would be amazing if he played right now, just not 2,850-yards amazing. Dimaggio went 56-straight games with a hit one fateful summer in 1941. The streak has become a coveted chase every year. Every year it seems that someone gets into the high twenties or low thirties, but nobody can hold a candle to Dimaggio’s 56. Stockton, 15,806 For this reason, Stockton was one of — if not the best — point guards in NBA history. The closest player to equaling this record is Jason Kidd, and he is 3,715 assists behind Stockton. The closest active player is Steve Nash, who is more than 5,000 assists back. 8. Career stolen bases: Ricky Henderson, 1,406 To put this in perspective, nobody else has broken 1,000 career stolen bases. In fact, only two have even broken 900. There is only one active player in the top 40 on this list. Either catchers have gotten better, or base stealing isn’t as much of an art as it used to be. 9. Gold medals in one Olympic games: Michael Phelps, 8 Ever yone remembers Phelps’ performance in Beijing in 2008. Phelps transcended swimming that summer in a way only seen by Michael Jordan and basketball in the ’90s. Even though Phelps was far and away the best swimmer that year, he still barely got all eight, earning one by .01 seconds. Phelps bested the previous record set by Mark Spitz back in 1972. 10. Women’s international soccer goals: Abby Wambach, 163 Last year Wambach passed Mia Hamm, who had 158 international goals. The thing that will make this record extremely difficult to break is how effective Wambach still is. She probably won’t retire until at least after the next World Cup, and with all of the qualifying matches and friendlies in that time, she will add a considerable amount of goals. – Jeffrey Dahdah is a sophomore studying statistics and journalism. He is a die-hard Cardinals, Rams, Jazz and Aggies fan. He loves sports statistics and loves to analyze sports and prove his points. Feel free to email him at dahdahjm@gmail.com or tweet him @dahdahUSU. • Letters can be hand delivered or mailed to The Statesman in the TSC, Room 311, or can be emailed to: statesmaneditor@ aggiemail.usu.edu. number (none of which is published). Letters will not be printed without this verification. We need to stop trying to explain away the truth just because we’ve had to wear a few extra layers of clothing recently. aren’t things our generation won’t have to deal with. An abundant amount of evidence suggests human actions are contributing to a warming global climate year after year. A report released in September by the Bulletin of the American Meteorological Society examined a dozen weather events from March through May 2012 that were considered to be out-of-the-ordinary, concluding that nearly 35 percent of extreme temperature highs in the eastern U.S. have been caused by man-made factors. More than ever, experts are reaching a scientific consensus on contributing factors. A 2013 report from the Intergovernmental Panel on Climate Change found more than 90 percent of the world’s scientists — the leading authorities on such matters — determined the human race and its activities to be the dominant cause of these global changes. So what does all this mean? It’s simple: we need to stop trying to debunk scientific evidence that has been proven and studied by the world’s best and brightest, and we need to stop trying to explain away the truth just because we’ve had to wear a few extra layers of clothing recently. As always, I welcome intellectual discussion and contribution, but when I’m speaking about scientific evidence, let’s go ahead and leave religion out of it. That’s like stirring a cup of coffee with a pencil and then telling me Nebraska isn’t landlocked — none of it make sense. Besides, if things don’t change soon, we’ll be discussing how to waterproof our copies of the Good Book when the ice caps melt. – Paul is the former features editor of The Utah Statesman and is a senior majoring in print journalism. Send any comments to paul.r.christiansen@aggiemail.usu.edu. • All letters may be shortened, edited or rejected for reasons of good taste, redundancy or volume of similar letters. The Democraticmajority New Jersey Legislature is on a witch hunt now. Opinions on this page (columns, letters) unless otherwise identified are not from Utah Statesman staff, but from a wide variety of members of the campus community who have strong opinions, just like you. This is an open forum. Want to write something? 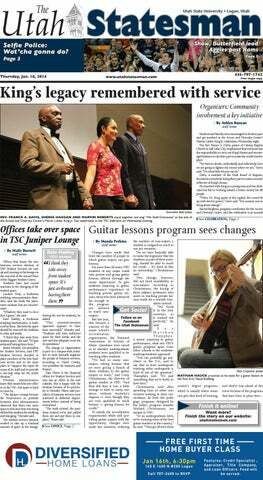 Contact: statesmaneditor@ aggiemail.usu.edu. be careful though, because if they push too hard, they will force more Republicans to come to the aid of the embattled Christie. Currently, many Republicans are happy to sit back and watch Christie’s reputation take a hit. Other possible 2016 GOP contenders, such as Sen. Rand Paul, R-Ky., and Rep. Paul Ryan, R-Wis., are not likely to be losing any sleep over Christie’s predicament either. That being said, if the Democratic Party pushes too far, they risk Republicans uniting against them. Even now, the Democratic National Committee is creating anti-Christie messaging memos for party members across the country. Christie is headlining a fundraiser in Florida this weekend for Gov. Rick Scott, who is up for re-election this year. DNC chairwoman Rep. Debbie Wasserman Schultz of Florida is planning on tailing Christie with a negative media counteroffensive throughout the state. With all of this in mind, everything related to the bridge scandal should be viewed with a bit of skepticism. Ask yourself what the author’s agenda is. Everyone has an agenda. For example, I am a Republican; I truly do believe Christie is currently the best candidate for the GOP in 2016. – Andy is a senior majoring in political science. He is currently the vice president of USU Pi Sigma Alpha, a member of the GRC, the Secretary of the Utah Federation of College Republicans and a member of USU College Republicans.